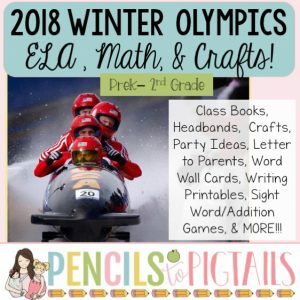 I never really think of February being a busy month in the classroom but it definitely is! Groundhog Day, Valentine’s Day, the Olympics this year, & President’s Day. Phew! 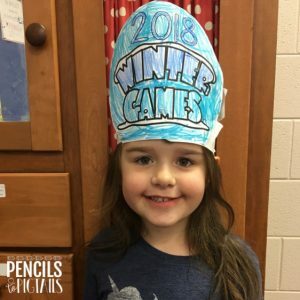 We have had an absolute blast studying the Olympics this year! 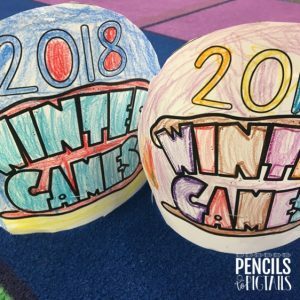 The Winter Games only come around once every 4 years so it is definitely worth following the games along with your students. I like to begin our unit with a quick read of this class book. After we read through the book, I give a pair of students a page with the text only and we illustrate our own class book. They LOVE to do this. It drives home the illustrator’s role and builds a deeper understanding of the material. 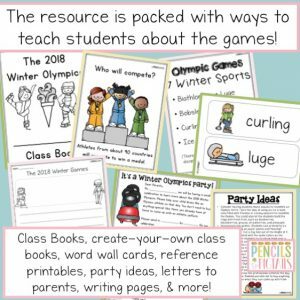 The class book and ALL of the activities seen here are included in my TPT resource. You can find it by clicking the cover below. I love to put word wall cards up for my students to reference as needed and the cards usually spark a discussion. It can get a little confusing but we discuss how there are 7 categories with 15 varied disciplines across the sports. Those 3 minute recaps are fascinating to watch each day. We found a couple of good YouTube videos to watch. They loved seeing the athletes actually perform. One thing included that I haven’t taken pictures of yet is the research project. Students are currently completing a project with their families. 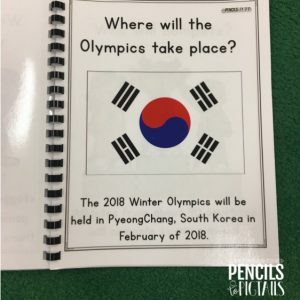 They choose an Olympian and do a little bit of research about the person. 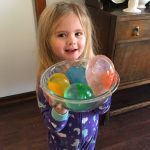 They are to be prepared to share by the end of the week. 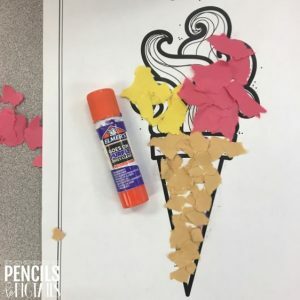 This is a colored sample I included to show the students my expectations. 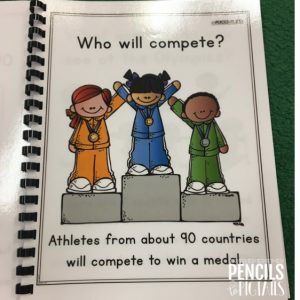 We didn’t do this one but you could also ask students to fill out this sheet where they choose what sport they would compete in. We made headbands to wear one day. The kids love wearing headbands to lunch. 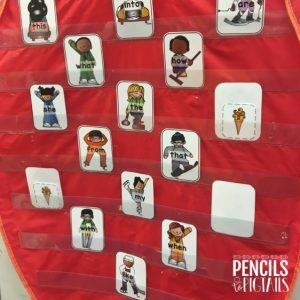 They are super simple when you staple them to a sentence strip. 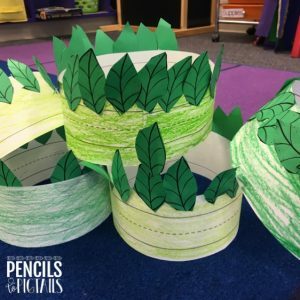 My students kept telling me they felt like kings and queens in these. 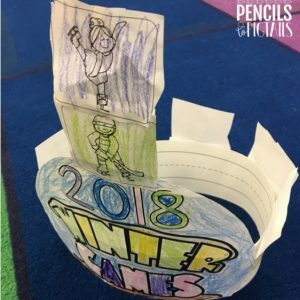 🙂 I told my students to color pictures of their favorite sports and attach them to the strip around the headband. You can see a few of them got quite creative! 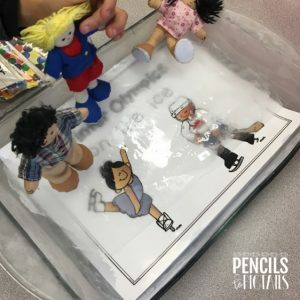 I also created an “ice rink” for my students to skate the figures from our dollhouse around in. They had so much fun with this! The trick was to laminate the sheet and lay it in the bottom of a casserole dish. I filled it about half full and stuck it in the freezer. Later I went back, added another layer, and put it back in the freezer again. I let them play with this during indoor recess. 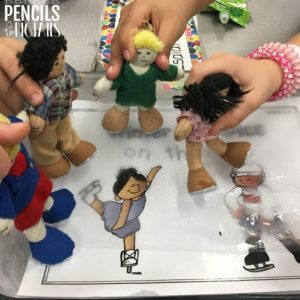 They skated those dolls around until they were soaked! 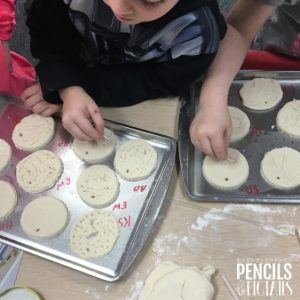 We also created salt dough medals. 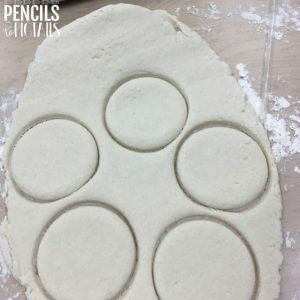 I went into a little more detail in a recent post about Christmas ornaments so I won’t go into it too much but basically we mixed 1 cup of salt with 2 cups of flour. 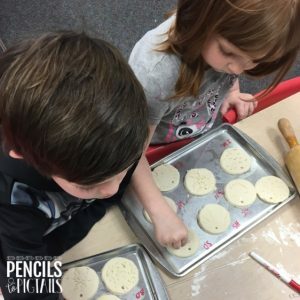 We added 1 cup of water and kneaded it until it felt somewhere between cookie dough and play dough. 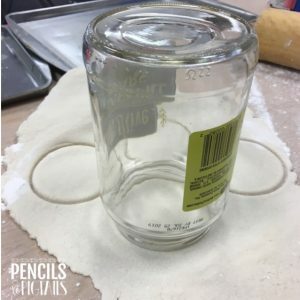 I used a pickle jar to form the circles. 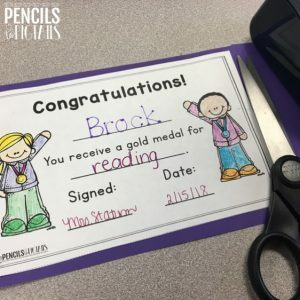 We laid them on a pan and labeled the “medals” with a dry-erase marker. Don’t forget to poke a hole through the top with a straw. 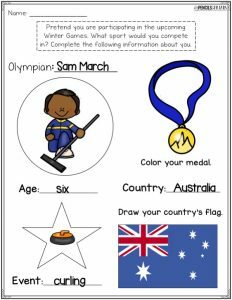 You will need this later to hang the medals around your little athletes’ necks! Instead of baking these, I’m just going to let them dry until they get hard. I’m planning to let the kids paint these tomorrow with bronze, silver, or gold paint. We will string these around their necks and the students will also be wearing these “laurel wreath crowns”. 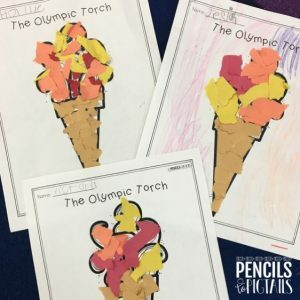 The torch was an easy craft I let my students complete during snack time. I almost forgot to share this fun game with you! 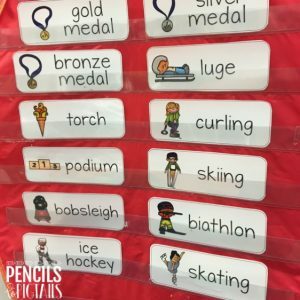 Hide the Torch (or medal) is such a fun way to practice sight words. 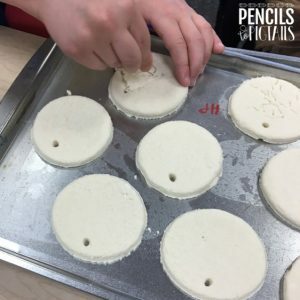 My students have been begging me to play this game with them every day. 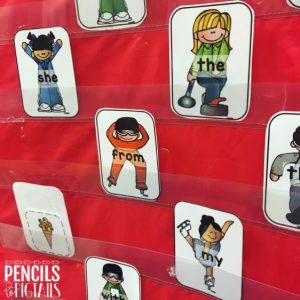 We discuss the words as I add them to the pocket chart. 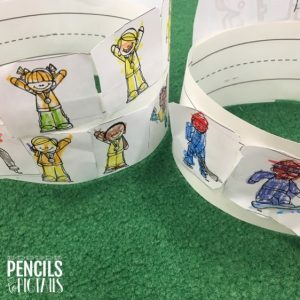 The students turn around and I place several torches behind various words. The student chooses a word to read and is then able to flip it over and see if one of the torches is behind it. 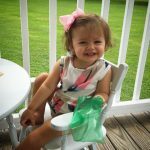 I usually give each child a piece of candy and the winners get to grab something out of the prize box. They LOVE it! 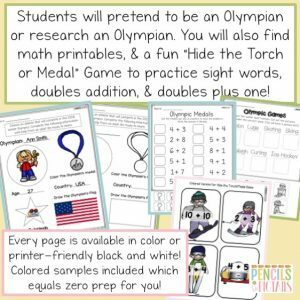 You can play this one with sight words, doubles, or doubles plus one. 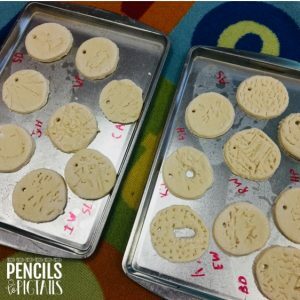 All of those options are available in the resource on TPT! 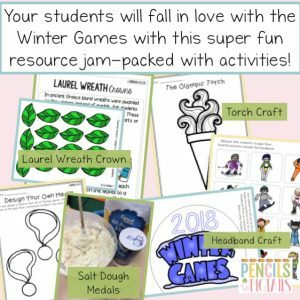 I’ve sent home the parent letter that is also included and we are looking forward to an EDUCATIONAL celebration Friday as we count medals, enjoy fun snacks, and complete other activities in the resource. 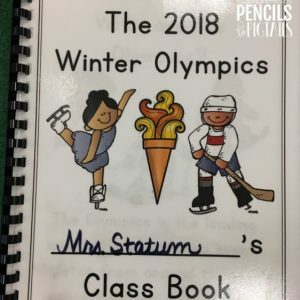 I know my little athletes will enjoy receiving their very own personalized certificate! 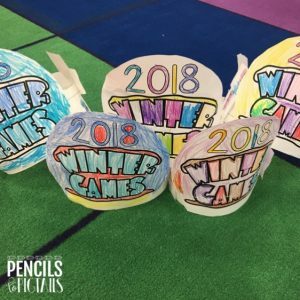 How are you celebrating the Winter Games with your students? Let me know in the comments! Click on any of these covers to grab your resource! Looking forward to President’s Day? Click here! 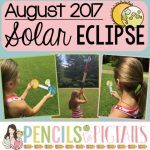 Pencils to Pigtails Blog – Happy Birthday George Washington! How about some St. Patrick’s Day fun? 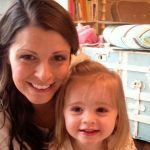 Happy Teaching & Mommy-ing this week friends!